1) Chambered in 9mm to match the primary caliber I use in my semi-automatic pistols. 4) Able to mount an optic. 5) It needs to be reliable enough that I would be comfortable betting my life and (more importantly) the lives of my loved ones on it. There are a lot of options out there. Many AR manufacturers have a PCC version of their wares out there. SIG has a whole line up of different models to choose from. 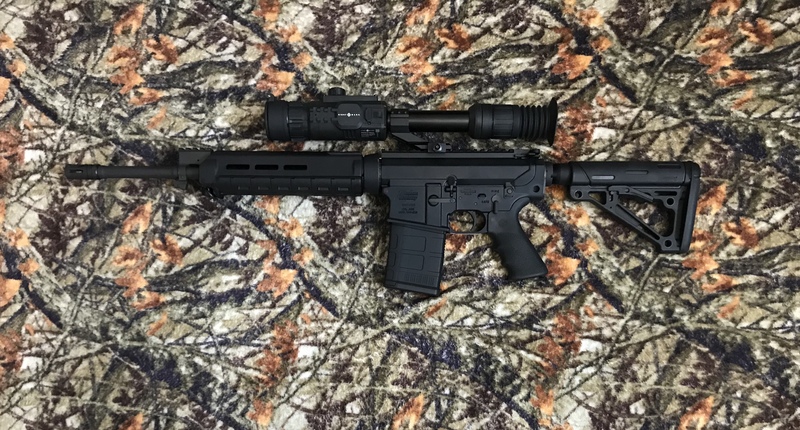 High Point, KelTec, the list goes on an one. I initially decided just to go with the Ruger PC carbine as it met all my requirements and I had a high trust level in Ruger LCR revolvers. For a variety of reasons I added the CZ Scorpion to my inventory and so decided to test them out head to head. My first impression of the Ruger PC Carbine was that, like me, it needed to go on a diet. It feels chunky in the hand and feels heavier than I would have expected (it is 6.8 lbs). 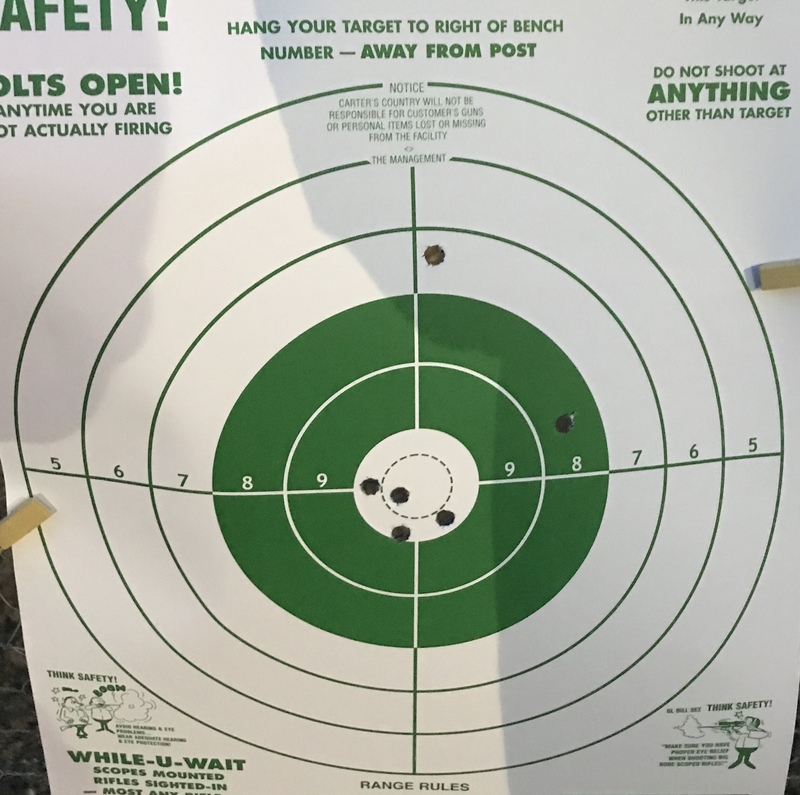 The adjustable peep sights work very well for me at self defense ranges (out to 25 yards). The fact that this little carbine is a take down model that can easily slip into a back pack nice bonus. …it seems to jam about every thirty rounds. Very disappointing, to say the least. It does this with several different types of ammunition from different manufacturers. I cleaned the rifle before I started the test and cleaned it again when changing out the magwell. No help. The problem seems to be with ejection. Rounds don’t eject fully before the action closed. I even had one instance with two spent casings still in the receiver. This was very disappointing although I had heard a few rumors about this being the case from various sources. I am very disappointed, not only because this is the only one of the two to meet all four of my core criteria but also because this is such a nice and easy gun to shoot and shoot well. I haven’t sent it back to Ruger yet but plan to soon. The CZ feels like a lightweight compared to the Ruger even though it is only a few ounces lighter (6.38 lbs). I think a lot of this has to do with the slimness of the carbine. It feels good in the hands (very subjective I know). The stock is adjustable for length of pull without the use of spaces like the PC carbine uses. While the CZ is not a take down the stock does fold making it easier to stow away although not as easily as the Ruger. 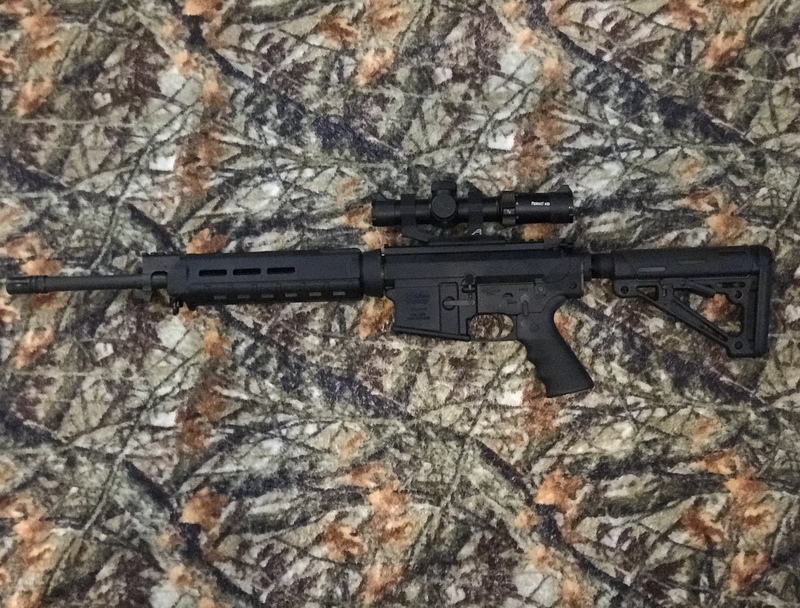 I was shocked how easy it is to disassemble this rifle. Push one (captured) pin and the trigger group drops out. Then the bolt assembly can be dropped out. 1, 2, 3 bing bang boom all done! As good as the sights are on the Ruger, the included iron sights on the CZ are even better. You have multiple apertures for varying levels of precision. They are also serrated on the back side to cut down on glare. At home defense distances (25 yards) they were very accurate and I was able to hit man sized targets at 50 yards with ease. With a red dot optic mounted it was even easier and faster to hit targets. I was even able to make shots out to100 yards and get reliable hits on man sized targets. Not too shabby for a 9mm. From a reliability perspective, the CZ is amazing and had zero issues through over 500 rounds. I did not clean the rifle at all during the testing but I did clean the two included magazines at about the halfway point. They were running reliably but they were getting harder to load and I wanted to see if they would feed as reliably after being disassembled. They were. An additional 20 round magazine and a 30 rounder also proved reliable in the testing. Magazines are pretty cheap with factory magazines running right around $20 each. Recoil is not a problem but it does recoil noticeably more than the Ruger PC Carbine. To be honest there is little difference between the recoil of the CZ Scorpion and an AR15 firing 5.56 ammunition. I think that’s where the extra bulk of the Ruger comes into play making it an incredibly light and easy shooter. The ergonomics of the CZ took a little getting used to and there are areas for improvement. As many have noted the safety lever is in a very bad location on the gun and tends to dig into the hand if you keep a high grip. I will definitely be changing that out. Fortunately there are plenty of options available on the market. There are also plenty of options for upgrading the charging handle, trigger and magazine release. I might change out the magazine release at some point as well but don’t see a reason to change anything else. Honestly, I really like both of these carbines…a lot. The Ruger is an incredibly light shooter and easy to handle. It meets all my criteria except for the reliability issue. If it wasn’t for that this would be a 100% recommendation. We will be sending it back to Ruger and see if they can correct the issue. Until then this is just an incredibly fun plinker. The CZ (in my mind) looks really cool although I wish I had spent the extra few bucks for the one in FDE because after having seen one it looks even better. The Scoropion handles and shoots very well. I could plink away with it all day. With the reliability it showed I would not have an issue betting my life on it either. It doesn’t meet one of my criteria (Glock mags) but it nails every other one into the dirt. I like this little carbine so much I find myself wanting to purchase the pistol version and add a brace or SBR it. One test I haven’t had a chance to do on the CZ Scorpion is to feed it self-defense ammo and see how she runs. Until then she is still a plinker and range toy. 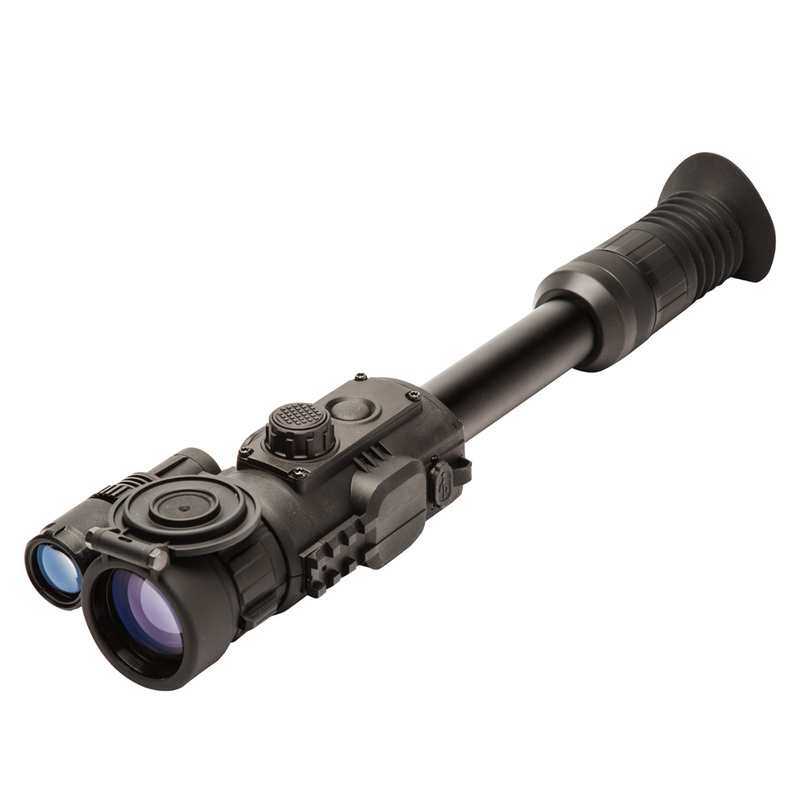 I have a decent red dot optic mounted (Vortex Venom) but would like a little larger one with longer battery life. I will probably buy a Primary Arms SLxZ Advanced Red Dot. I have had incredibly good luck with PA red dots and the SLxZ offers 50,000 hours of battery life. With battery lifer like that I will leave it on all the time and just replace the better once a year or so. As I mentioned I will be sending the Ruger in to see if they can correct the issues. I’ll post an update here when I do. I hope you found this informative. If you have any questions or comments please feel free to leave them below. I have a crazy fascination with the .327 Federal Magnum cartridge and, to be honest, with .32 caliber revolver cartridges in general. The .327 Magnum was designed specifically to provide similar ballistics as a .357 Magnum and do so with less recoil and out of short barreled revolvers (snubbies). Another advantage of the .327 Magnum is that, out of the same sized cylinder, you can get extra round. For example, my .327 Ruger LCR is a six shot revolver that is the same size and weight as a five shot .357 Magnum LCR. The five shot .38 Special LCR also the same size although a few ounces lighter. 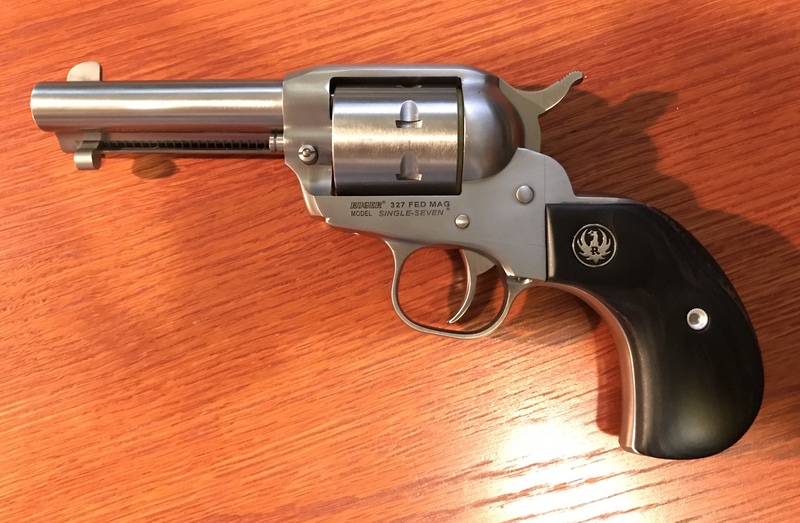 I also love single action (cowboy) guns so when Ruger released the Single Seven chambered in .327 Federal Magnum it immediately rocketed to the top of my wish list…and stayed there. I didn’t get a great deal on it but I didn’t get a horrible one either but in any case, Merry Christmas to me! Needless to say I couldn’t wait to get it to the range. Unfortunately, all is not roses and unicorns with the little Single Seven. The base pin that the cylinder rides on backs itself out under recoil binding up the gun. It started exhibiting this behavior after a few rounds of .327 Magnum but by the end of the range session it was even doing it with light .32 Smith & Wesson long rounds as well. A quick call to Ruger an a replacement base pin is on the way. If that doesn’t resolve the issue it will have to be sent back to them for repairs. To say that I am a little disappointed would be bit of an understatement. 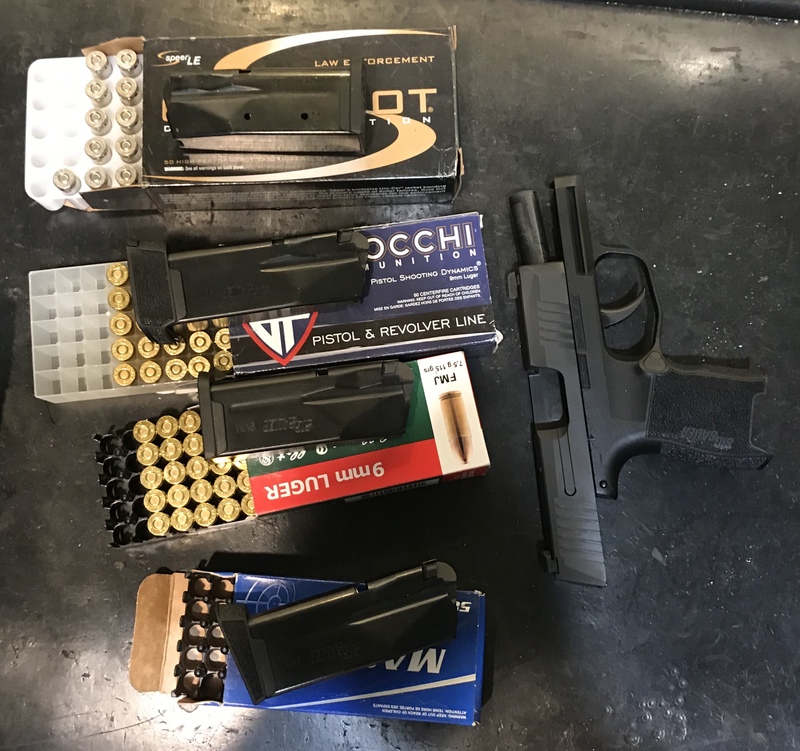 After another quick range session this week the round count on the little SIG P365 is now up over 350 and no issues so far. I brought five different types of ammo along this time out including some of my reloads that are pretty lightly loaded and some Speer 124 Grain Gold Dots and, as I already stated, there were no issues feeding or extracting any of the rounds. The little SIG has not been cleaned yet and I notice the slide doesn’t cycle quite as smoothly as it did a few hundred rounds ago but, again, no malfunctions so far. I always worry about the reliability of pocket-sized semi-autos. Lint, dust sweat, heat all tend to conspire to generate failures. The Glock 42 and 43 were exceptions to this rule and, so far, so is the P365. That gives me a good bit of confidence in the gun. The Kahr seemed to want to be cleaned and oiled nightly to be 100% reliable. I plan to put another 150 rounds through it to see if it can maintain that level of reliability. The I will give it a much needed cleaning and check for any signs of wear that would be out of the ordinary after 500 rounds. If it still proves reliable it will probably make its way into my regular carry rotation. I picked up an additional magazine for the P365 and it ran just fine while at the range. It did highlight one down of the SIG vs. the Glocks, $50 dollar magazines instead of sub-$20 magazines. I have been able to find them on sale so one I bought was $40 and the other one was $30.